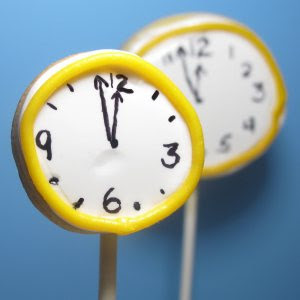 Meaghan did a flashback of these cute New Year's Eve party treats, almost midnight cookie clocks, that she posted on her blog back in 2008. These fun cookies are easy to make with the help of food color markers and these yummy cookies would be a fun edible craft for the kids to tackle at a party. Make them ahead of time and let them do the decorating. You can check out the New Years eve clock cookies over at The Decorated Cookie.